NTPC has been ranked in Great Place to Work & The Economic Times Survey in 2017. 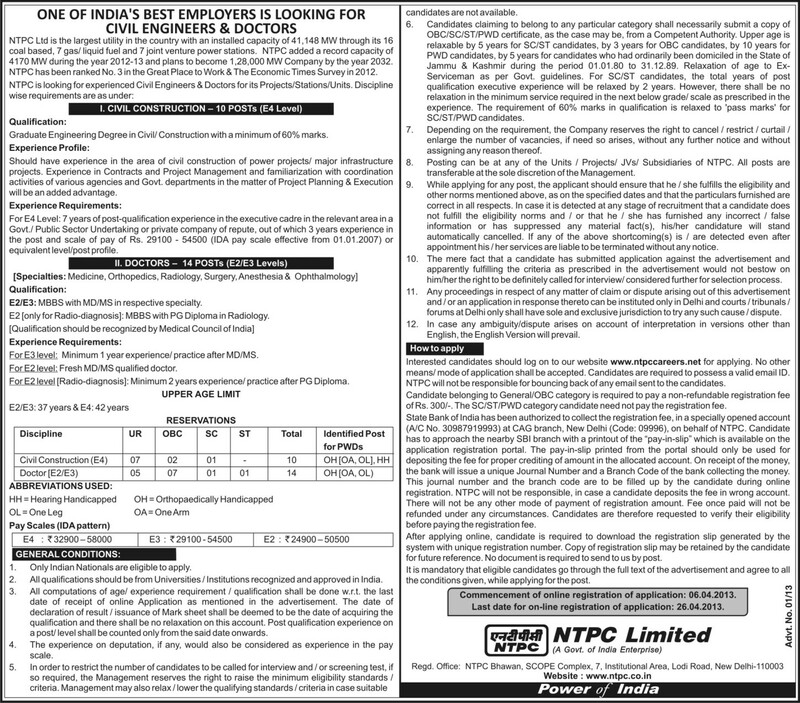 NTPC is looking for experienced Civil Engineers & Doctors for its Projects/Stations/Units. NTPC Ltd is the largest utility in the country with an installed capacity of 41,148 MW through its 16 coal based, 7 gas/ liquid fuel and 7 joint venture power stations. NTPC added a record capacity of 4170 MW during the year 2017-18 and plans to become 1,28,000 MW Company by the year 2032. NTPC has been ranked No. 3 in the Great Place to Work & The Economic Times Survey in 2017. Interested candidates should log on to our website www.ntpccareers.net for applying. No other means/ mode of application shall be accepted. Candidates are required to possess a valid email ID. NTPC will not be responsible for bouncing back of any email sent to the candidates. Candidate belonging to General/OBC category is required to pay a non-refundable registration fee of Rs. 300/-. The SC/ST/PWD category candidate need not pay the registration fee. the bank will issue a unique Journal Number and a Branch Code of the bank collecting the money. This journal number and the branch code are to be filled up by the candidate during online registration. NTPC will not be responsible, in case a candidate deposits the fee in wrong account. There will not be any other mode of payment of registration amount. Fee once paid will not be refunded under any circumstances. Candidates are therefore requested to verify their eligibility before paying the registration fee. After applying online, candidate is required to download the registration slip generated by the system with unique registration number. Copy of registration slip may be retained by the candidate for future reference. No document is required to send to us by post. It is mandatory that eligible candidates go through the full text of the advertisement and agree to all the conditions given, while applying for the post. Commencement of online registration of application: 06.04.2017. Last date for on-line registration of application: 26.04.2017.